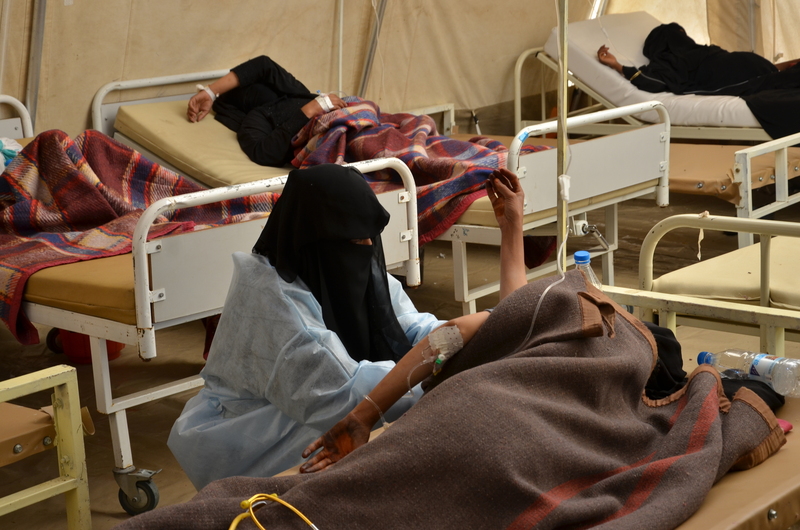 Since 30 March, Médecins Sans Frontières/Doctors Without Borders (MSF) has treated more than 12,181 patients across seven governorates (Amran, Hajja, Al-Dhale, Hodaidah, Ibb, Taiz and Sana’a). We also support the Ministry of Public Health and Population, helping train staff in cholera response and contributing donations. Due to the quickly growing number of cases, we are continuing to expand the capacity of some of our Cholera Treatment Centres (CTCs). This involves opening new centres, evaluating their needs, and supporting them through donations. After treating patients, the next step is to focus on outreach activities. In Yemen, many households have individual wells which makes detecting corrupted water sources a very long process. We will focus on chlorinating these wells, and push hygiene promotion in hard-to-reach areas. UNICEF's chlorination of all water-trucking in Yemen's capital, Sana'a, has been important to stabilising the cholera outbreak. Humanitarian actors need to multiply similar efforts across the various affected governorates.